Whether you’re a work-from-home professional, a small business or a large business we have office furniture to fit your needs at prices to fit your budget. For the past few decades working from home has become a way of life for many people either operating their own business or working remotely for their employer. Regardless, a great deal of your day is spent sitting at your desk and working on your computer or laptop. It is essential to have comfortable home office furniture much like you do in an on-site business office to help keep you comfortable, productive, and efficient. Ergonomically designed furniture helps you to maintain good posture and stay physically healthy, which is important seeing as we spend so many hours at our desks. Office Furniture Concepts has a stunning array of desks, credenzas, bookshelves and office furniture seating from which to choose. Whether you have a large room set aside for your office or a smaller workspace, we have the office furniture to suit you. 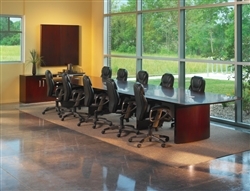 For smaller workspaces, compact office furniture is available in a number of finishes and designs. Contoured work surfaces and metal supporting structures create a sturdy workplace in a variety of colors. Waiting room furniture sets the tone and can leave your visitors feeling comfortable and confident or less than impressed. Ensure that your guests feel, “I want to do business with this office” as soon as they hit the door by making the waiting area/lobby comfy and stylish. Any visitor to your workplace can’t help but be impressed with our wide range of stylish lobby furniture. Whether they are a customer, supplier or a personal guest they are sure to have a good and lasting first impression of your organization. Reception desks are available as stand alone, L shaped or U shaped and are constructed and finished in many material choices. Glass tops with a wood base are very popular as are complete wood finishes to complement your overall décor. Reception office seating can be matched to any desk choice with accompanying tables giving your guests a sense of comfort, warmth and style. Bench style ensembles and stand alone tables and chairs are durable and not only withstand the test of time but also look sensational. Office Furniture Concepts has over 20 years experience in the industry and offers free planning advice and shipping (see details) for our customers on a nationwide basis. You can visit us on Facebook, Google + or follow us on Twitter for recent updates and new products available. Or you can reach us by telephone at 888-632-8480.